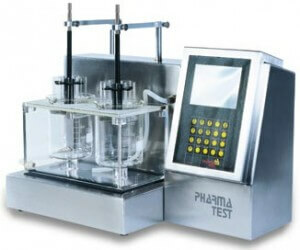 An Automatic Disintegration test is performed with the pharmacopoeial standards. Disintegration is a measure of the quality of the oral dosage form like tablets and capsules. Each of the pharmacopoeia like the USP, BP, IP etc each have their own set of standards and specify disintegration tests of their own. USP, European pharmacopoeia and Japanese pharmacopoeia have been harmonised by the International conference on Harmonisation (ICH) and are interchangeable. The automatic disintegration test is performed to find out the time it takes for a solid oral dosage form like a tablet or capsule to completely disintegrate. The time of disintegration is a measure of the quality. The Pharmatest PTZ AUTO allow the entry and recall of stored methods. With the levels of security and results reporting now specified by FDA regulations, this instrument fulfils all these requirements, yet offers an easy interface for routine use. A print out of the method, medium and results, even in manual mode, gives a permanent record of the test. As with all of the PTZ AUTO series it is upgradeable at any time to a fully automated disintegration version, with an electronic basket PT-MKT to detect the individual disintegration time of each sample. No need for electric basket lifts either as the PTZ AUTO have this feature as standard. Available as PTZ AUTO 1 (1-4 independent testing positions), PTZ AUTO 2 and PTZ AUTO 3 and PTZ AUTO 4. All of the PTZ AUTO automated disintegration test instruments meet the specifications of USP <701/2040> and EP <2.9.1/ Test A and B> monographs in full.